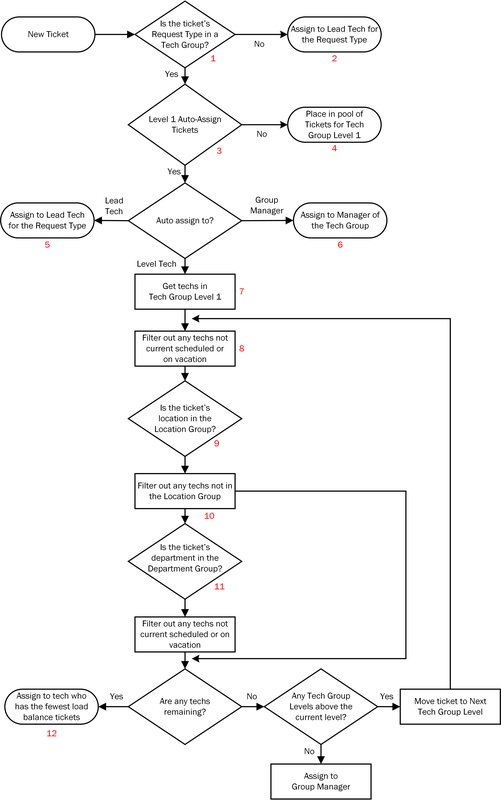 The following diagram details the Web Help Desk ticket assignment logic. The illustration includes numbered references for some processes. Listed below are the corresponding paths in the Web Help Desk user interface to make any needed changes for each numbered process. See Define Tech Groups for more information. In the Request Types Supported tab, view the supported request types. See Define Request Types for more information. If the Tech is marked On Vacation, the ticket is assigned to the Backup Tech in the Tech's profile. If this Tech is marked On Vacation, the ticket is assigned to the Backup Tech in the Tech's profile. See Define Techs for more information. See Enter Locations for more information. See Define Status Types for more information.